For decades, the backsplash has been an important working part of any kitchen remodel. In addition to protecting the walls above a work area, it would complement the countertop as well. In the early years, backsplashes were often colorful with fruit and vegetable graphics adorning 4×4 ceramic tiles. Today we have the luxury of installing a variety of materials like natural stone, glass, mirror, metal, brick and wood. Backsplash design has become more creative and artful to incorporate textures and different shaped tiles. Today, you find a mixture of traditional and contemporary backsplash designs with personal touches sprinkled in. Below, we look at 8 backsplash design trends that will gain popularity in 2019. What area comes to mind when you think of backsplash tile? The space between the countertop and the underside of the wall cabinetry. If there was no wall cabinetry above the countertop, then it was common to still place the tile straight across in the same location as if there had been a cabinet there. Perhaps by instinct or tradition, but it’s time to break the mold and bring that tile all the way to the ceiling. In 2019, we expect to see the continued trend as more and more homeowners do away with wall cabinetry and opt for open shelves or windows. Ceiling-height backsplashes can give classic tile a fresh and modern look by highlighting a single area of the kitchen, creating a focal point, or by helping a large patterned tile sing loud and proud. Higher backsplashes will unite and brighten up the space with the reflective qualities of the tile itself. Especially using white subway tiles. Not to mention that tile can create a visual break from all the cabinetry making the kitchen feel more open by adding surface area. creating a stunning background for your work area. Feel free to play around with a combination of colors, textures, and patterns to create an even more luxurious look. 2. Larger Subway Tiles - Not just 3”x6” Anymore! The most common size for Subway tiles is 3” x 6”, which have remained popular for years. A true testament of design & function. But as a result, homeowners are left craving something a little different. With subway tiles still being a hot trend for kitchen backsplashes, it’s not surprising that we are seeing the emergence of larger sizes. Homeowners love them still, for their clean classic look and super easy maintenance. But a few changes are in the air as we travel into a new year. Specifically, we are beginning to see manufacturers produce subway tiles in larger sizes. The standard large format size is 4″x 8″ or even a 4″x 12″ though you can check what sizes are available at your local dealer. A large format subway tile backsplash can be especially helpful for a small kitchen where the large tiles create the perception of space. Large format subway tiles can also help in creating a feeling of continuity especially if you are extending the backsplash to the ceiling; besides, let’s not forget the ever favorite…fewer grout lines to clean. These two types of tile finishes are bound to pick up in popularity in 2019 as homeowners seek unique but subtle styles for their kitchen or wet bar backsplashes. The mirror finish gives tiles a glossy reflective surface, which is highlighted even more when struck by natural light. The mirror effect is even stronger when you extend the backsplash to ceiling height. With a mirrored subway tile backsplash, use lighting to bring out a dramatic effect. During the day, make sure there is plenty of natural sunlight falling on part of the backsplash. The reflected light really brightens up the kitchen. At night, position some of your fixtures (e.g. under cabinet lighting) to take advantage of the glassy backsplash. The light reflection can make for quite a dramatic look. If the glossiness is too much for you, try a metal finish. Tiles are finished in a look and texture that resembles that of real metals. You can choose from different colors, finishes, and treatments. A metal finished backsplash gives your kitchen an unstated “strong” feel. It can bring in an industrial feel, which can be enhanced by extending the backsplash across the entire wall height. You can also use smaller metal-finished tiles for a dramatic accent. With the neutrality of quartz countertops, it is no longer enough to have a plain tile backsplash; more homeowners want something that turns heads and creates an interesting focal point for all to admire. Many are beginning to experiment with various tile patterns. Upcoming 2019 tile patterns include: chevron, herringbone, Moroccan fish scale and laser cut tile among many others. One of the hottest upcoming trends involves the use of graphic print or large pattern tiles in big, bold colors. These oversized patterned tiles have the punch to liven up any space to make any homeowner proud. Keep in mind that the tile will have repeats much like wallpaper. It’s important to lay out your design ahead of time so that it ends up looking balanced. Check what patterns your local dealer has and see how you can integrate them into your kitchen backsplash. Since most of these patterns will be “busy” you have to be careful not to create an overly exciting or over-cluttered kitchen. With this pattern, we would recommend a plain countertop or even white cabinetry to highlight the beauty of the patterned backsplash. Feel free to take the backsplash as high as the ceiling to make it even bolder. It will not just be a protective surface; it will be a piece of art. With technology so advanced, there is virtually an endless option of finishes to choose from. If you want a backsplash with a slightly aged appearance, look for tiles with a weathered finish. For a washed-out look, go for tiles with an acid wash finish. A lot of finishes are aimed at mimicking natural appearances for a more authentic look. For instance, you can get tumbled tiles that have been designed to resemble natural stone. They have an appealing antique look to them. The natural stone effect can also be seen in matte or honed finish tiles, which are especially popular in luxury themed kitchens. There are dozens of finishes you can choose from depending on what kind of style you want for your backsplash and your entire kitchen area. Whether you want glossy and reflective, rustic and country or aged and weathered, they are all available. Most people are used to neutral (white, gray or beige) backsplash colors. But now you can get tiles in almost any color you want, backsplashes in 2019 will see a lot more color. From divine black to splashy yellow, anything goes. The backsplash is a good opportunity to introduce personal style a surprising pop of color in the kitchen will just do that. If you want to convey luxury, go for black or charcoal grey tiles. The contrast from surrounding elements such as the cabinetry and countertops will create the luxurious drama desired. Make sure you have a good lighting plan, in place, so you can see the beauty. If you want an airy feel to your kitchen, good ole white will work just perfectly though you might want to consider a contrasting grout color for an unexpected twist. A blue-tiled backsplash introduces a homey feeling. It makes the kitchen feel like a happy yet cool and relaxing place. If you want a burst of energy whenever your eyes drift to the backsplash area, go for red or yellow tiles. If you are feeling creative, combine two or three colors for a nice feature to your work area. A green band at the bottom of the backsplash and a white half that stretches to the ceiling results in a simple yet creative alternative. 2019 is the perfect time to experiment with new styles and colors. Try a color you would have never even considered and see the magic happen right before your eyes. If you are feeling hesitant, you can always introduce the new color in one or two lines or in individual tiles scattered throughout the backsplash. Tile is the mainstay of kitchen backsplashes. For years, backsplashes have been made from tile, whether they are ceramic, porcelain or natural stone. Slabs are a very different approach. Unlike tile, it is a continuous piece with few breaks. Sizing will depend on the material used, but it probably won’t be much smaller than a 4’ x 8’ sheet. So instead of many individual small tiles making up the backsplash, you have one large slab stretching the entire backsplash area. Marble and marble looking slabs are becoming especially common and into 2019. Mostly what draws people is its pure beauty, subtly of color and it’s unique variation in veining for stunning aesthetic appeal. Being one large slab, any design aspects on the surface focus the attention. In some cases, a slab backsplash can help create a smooth transition from the countertop to the backsplash. Now you have the added bonus of not having to clean up in those dreaded grout lines. The design choices are limitless. You can choose a slab with slight color variations all the way to dense veining patterns, the choice is yours. At a time when everyone wants their homes to be unique, it is inevitable that alternative backsplash materials would come into play. 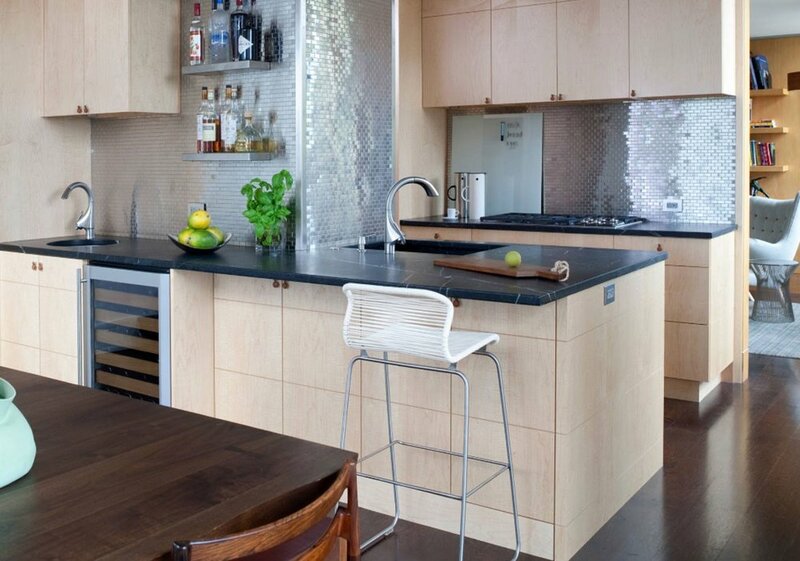 This time don’t just consider just a metal-finished tile backsplash, but metal sheet goods as a backsplash. Some favorites to keep an eye on would be: stainless steel, copper, aluminum, zinc and/or perforated. The same applies to glass-finished backsplash. You can now get full glass tiles to use for your backsplash. Why not incorporate a mixture of materials such as glass and steel? Some people even get creative and put a fabric behind the glass to create a unique look without having to worry about cleaning and or fire hazards. Or what if you were to paint the back of the glass with your preferred color. How fun is that? There even can be wooden backsplashes such as wood cladding, shiplap, beadboard, or wainscoting that can take your kitchen to the next level. Although you will find most of these in furniture pieces versus around the cooking surface, since this could be a maintenance challenge. You would need the right wood with a protective finish. But don’t rule out wood as a wall finish treatment instead of paint. What backsplash trend will you choose? Ceiling height backsplashes, metallic tiles, or bold patterned tiles? Choose from the hottest backsplash design trends and make your kitchen look amazing!